Composed by Johann Sebastian Bach (1685-1750). Arranged by Penny Johnson. Baroque Period. Score. 36 pages. Published by Penny Johnson (S0.308269). The magic of the music of J. S. Bach is that it lends itself well to being flipped upside down. 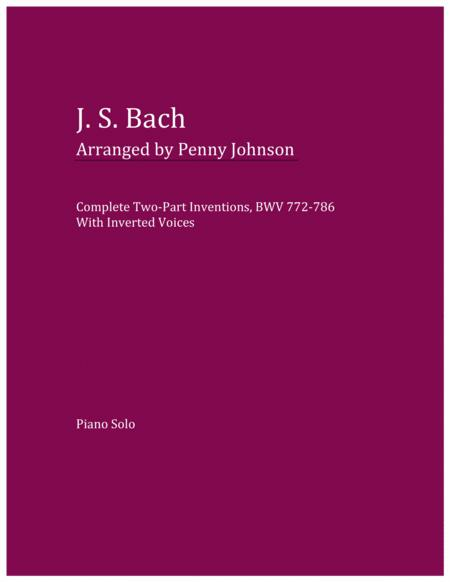 This edition of the complete Two-Part Inventions, BWV 772-786 has been arranged for inverted voices by pianist, Dr. Penny Johnson. Players seeking a fresh, stimulating way in which to experience these pieces will find the edition of value. 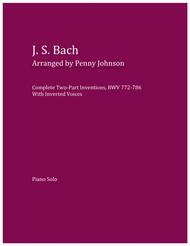 "The following pages contain arrangements of the Fifteen Two-Part Inventions of Johann Sebastian Bach for inverted voices. This process involves the right hand playing the left hand part and vice versa. It is expected that, in combination with study of the original setting, these arrangements will enhance the player's ability both to think and listen contrapuntally. The idea for creating the arrangements came from the renowned Bach pianist, Rosalyn Tureck who, having written extensively on the subject, prescribed the task for ambitious students. Apart from her arrangement of Invention #1 in C Major, there exists no known further written out settings. With the exception of some changes in register that were made in order to avoid having the parts stray too far from one another, all of the content found in the original setting has been preserved. The process of playing and listening to these arrangements offers a unique experience, a kind of musical equivalent to looking up through a glass rather than down on it. Indeed, even when played with opposite hands, these pieces still stand independently as well-crafted and aesthetically pleasing works."